I recently had the opportunity to attend the AIS Summit in Hamburg, Germany and I made some interesting observations about this maritime technology. Automatic Identification System (AIS) may have been originally designed for collision avoidance but of the over twenty presentations at the show, only two spoke on this topic. All other presentations were focused on how AIS data is being used to augment the “big data set” used in maritime intelligence applications. For example, Pole Star uses AIS data to verify that a ship entering port has not previously entered any blacklisted ports and sanctioned countries. Recently, that capability was used to screen ships that had docked in countries hit by Ebola and alert port crews. SkyTruth uses AIS data in their Global Fishing Watch application to give citizens a simple, online platform to visualize, track and share information about fishing activity worldwide. The platform uses AIS data to analyze “human interaction with the ocean”. According to the founders, fishermen can show how they are doing their part to fish sustainably and citizens can watch the places they care about and work together to restore a thriving ocean. Some other interesting applications included how AIS data and analytics is used for the development of antifouling coatings on shipping vessels as well as to provide real-time reporting on movement of commodities like coal, iron ore, oil, LPG, LNG and chemicals for trading and shipping companies. 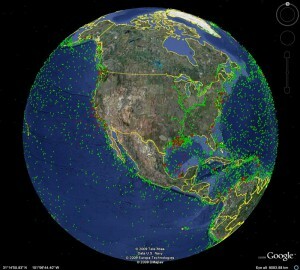 On a technical note there were several discussions on the reason for and impact of errors in AIS data. ORBCOMM’s George Best provided the results from an Australian Maritime Safety Authority (AMSA) study that found that despite all the hype, only 0.027% of AIS messages had errors. Of those, many could be avoided with well documented procedures and training. So what is the future of AIS? As companies like ORBCOMM augment their AIS capabilities to provide more frequent reporting and companies like Google leverage the data with their Big Data processing techniques, we will see AIS data become an important data source for intelligent applications that provide the big picture and identify large patterns. I’m currently using AIS data to track the ships of opportunity that tow our Continuous Plankton Recorders. Historically we have asked the ship’s crew to complete a tow log but errors always creep in and are sometimes hard to rectify after the event. AIS provides a cheap method of tracking the ships compared with fitting our own GPS systems, and sensors carried by the recorders give me shoot and haul times. It has been hard trying to convince everyone to embrace the new technology, but I’m getting there! Hi Rob, it sounds like you have an interesting application. I find it amazing how many innovative uses there are for AIS and your note highlights how the service can be used to automatically track vessels and eliminate the need for manual tracking which can be cumbersome and error-prone. Thank you for sharing!